Heading for a goal of $1000 earned from writing articles which means I have to submit more articles and run the risk of rejection but as they say no pain, no gain in anything you try. Safety or comfort zone living leads to no progress. 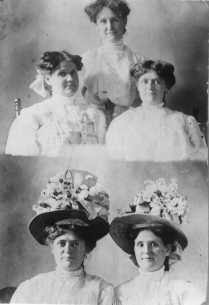 I love these photos of my grandmother Johnson and her sisters-Ada and Carrie. What fun hats! GMJ is in the middle in the top photo. She looks young and carefree but she would marry become a mother of five then be widowed when her husband died of stomach cancer. I've written lots about her life because she was part of my life until her death in 1967. When my mom was widowed, we moved in with GMJ. I remember her as always positive, fun and outgoing. Loved to drive and would head out for California or Wyoming to visit family at the drop of a hat. She had health and family concerns but overall she remained positive. Always there to listen to and encourage you, she's still there as our family's guardian angel. I've written much about her. See my article on A Skinny Grandma. I love her. She has wise and bright eyes, Lin. What an inspiration. We have to keep on going, don't we? When we give, we have plenty to give. Thanks for this post today. Any woman who wore a saucy hat like that would have been a friend of mine! You know how I love hats. You come from a long line of strong, independant women, Lin. Any story I would write about my grandma would have to be kept for the family library only. She was a little minx! Married at 16 (she was expecting my mother) she remained a little girl in so many ways until the day she passed away. I adored her! She was very petite and incredibly pretty with thick, black hair and sky blue eyes. One of her greatest disappointments is that she never got to hop a train. She always wanted to take a rail ride with the hobo's. She had gypsy in her soul. I know my grandma certainly did! Ah ha! So this is where you get your positive outlook from, Lin. You are so caring and strong. I love those long ago photos. They look like they're about to tell you a story. I enjoy being retired from fulltime mothering, love having grandchildren, visiting family, and living in Southern Utah where it's warm in the winter. I'm interested in making new friends on the Internet, publishing my writing, and pursuing my interest in poetry and photography.